From the Bowery Boys and the Five Points Gang through the rise of the Jewish 'Kosher Nostra' and the ascendance of the Italian Mafia, mobsters have played a major role in the city's history, lurking just around the corner or inside that nondescript building. Bill 'the Butcher' Poole, Paul Kelly, Monk Eastman, 'Lucky' Luciano, Carlo Gambino, Meyer Lansky, Mickey Spillane, John Gotti-each held sway over New York neighborhoods that nurtured them and gave them power. As families and factions fought for control, the city became a backdrop for crime scenes, the rackets spreading after World War II to docks, airports, food markets, and garment districts. The streets of Brooklyn, swamps of Staten Island, and vacant lots near LaGuardia Airport hosted assassinations and hasty burials for the unlucky. The bloodlettings, arrests, and trials became front-page fodder for tabloids that thrived on covering Mulberry Street. Chinese, Russian, and Greek mobsters rose to prominence and wrought bloody havoc as well. 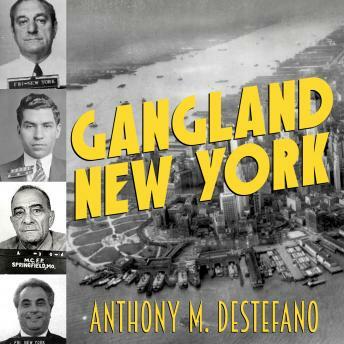 Each of Gangland New York's five sections-one for each borough-traces criminal activities and area exploits from the nineteenth century to now. Everyone knows about Umberto's Clam House in Little Italy, but now you can find Scarpato's restaurant in Coney Island, where Joe Masseria was killed by henchmen of Salvatore Maranzano, who in turn died in a Park Avenue office building at the hands of 'Lucky' Luciano a few months later. From the Bronx to Brighton Beach, from New Springville to Ozone Park, here is a comprehensive, on-the-ground guide to mob life in the Rotten Apple.